The iOS Health database may be the easiest database to acquire. While other databases need physical file system dumps of the devices, this database can be accessed with an encrypted iOS backup, or possibly an iCloud acquisition. If you happen to have a file system dump these databases can be found in /private/var/mobile/Library/Health. The database we are going to be looking at for this article is the healthdb_secure.sqlite database. Retention of Pattern of Life data is also an issue as well. Some data is kept around for a day, some is kept forever. The data in the health database is by far has the most longevity. Users generally want to keep these records indefinitely. Apple makes it easy to backup and restore Health data to new devices. My own personal health data goes back years! It is worth mentioning that this longevity will also make a very large SQLite database, mine is currently at 820mb, that’s a giant SQLite database! This particular one is from iOS 12.1.1. NOTE: In the following screenshots I’m not showing the output from the APOLLO script only due to ease of readability, however all data represented in this output is in the script output. The health_distance module extracts the recorded distance in meters for a specific period of time. The data type of ‘8’ is how the Health database keeps track of this distance. More of these data types will be explored. 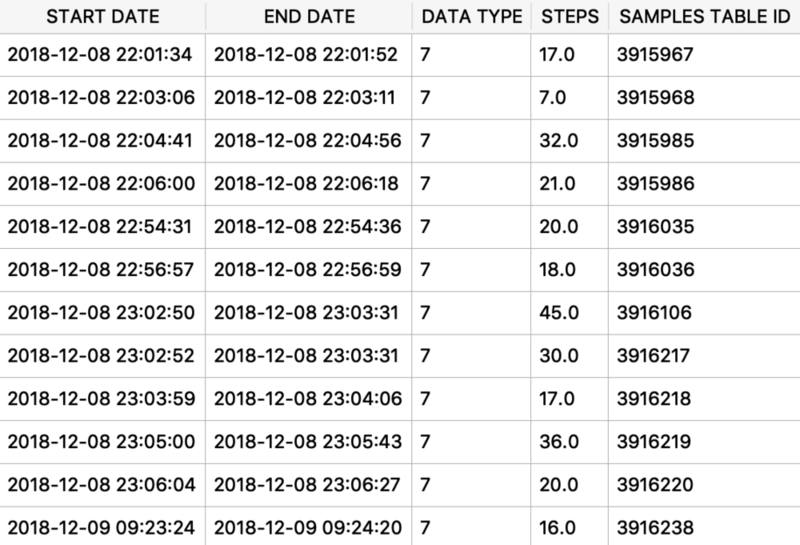 Along the same line is the health_steps (data type = 7) module. If the user has a paired Apple Watch, it will record very regular heart rate readings (data type = 12). We can view this with the health_heart_rate module. This is the same datatype that is recording the new ECG heart monitor on watchOS 5.1.2/iOS 12.1.1. Time to take a stand, the Watch records this action too! The health_stood_up module will show this (data type = 75). Finally, we end with some location information. Each time I record a workout on my watch, its starting location is also recorded. Using the health_workout_locations_start and health_workout_locations_end modules we can see these coordinates. 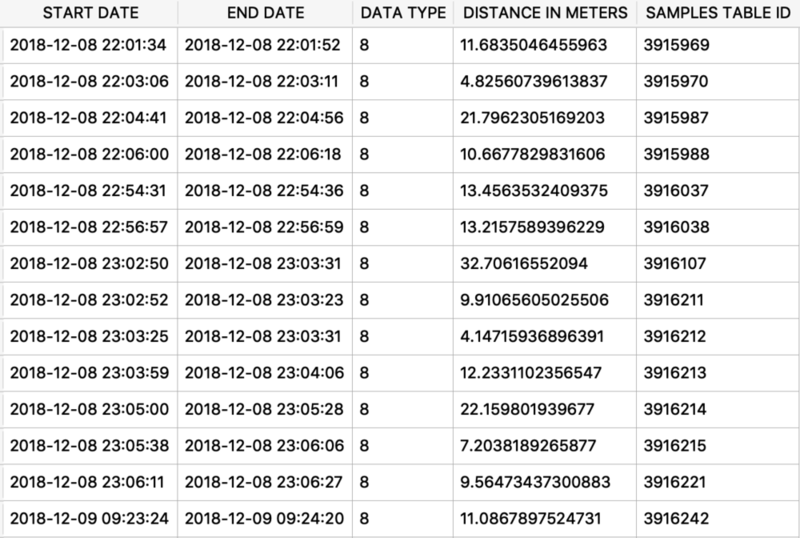 The timestamps record the start and end timestamps of the workout, but only records the start in this particular “metadata key”. Full workout locations are stored elsewhere (still working on this one). The iOS Health database is one of the largest databases on the system. I hope to have many more modules/queries created for many of the metadata entries captured in the health data, there are hundreds of data types! Got a special request, let me know! If you want more information on iOS Health data, Heather Mahalik and I discussed this database recently at the SANS DFIR Summit in Austin. Now go eat cookies. I won’t judge you.